With the addition of a handicap bathtub or a handicap shower, the lives of the elderly and the handicapped will be improved. The modifications are well worth the cost and time. The use of handicapped accessible bathtubs and showers has improved the lives of millions of disabled people. Handicap bathtubs and showers may also improve the lives of the elderly or people with diseases that cause frail bones. 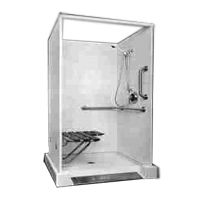 These handicap bathtubs and showers reduce their chances of falling and improve their well-being. It is important to explore all your options and figure out the products that meet your budget and needs. There are different handicap bathing options. These options range in style from the simple and inexpensive shower chair, costing anywhere from $20 to $300, to the most extravagant of whirlpool therapy type tubs that may cost from $1,000 to $10,000 dollars. Accessibility varies with each type. With a shower chair, the tub itself remains standard and the chair is placed into the existing tub. A handicap shower will cost anywhere from $500 to $3,000. Handicapped accessible showers work in such a way that removes the door or curb entrance, thereby enabling the user to walk directly in, usually by stepping or rolling their wheelchair over a slight curb or ramp. 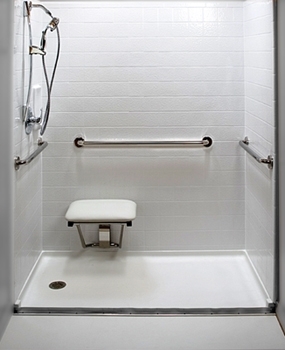 Some handicap showers and bathtubs have a roll in shower design where the user is able to drive their wheelchair directly into the shower or tub. Yet another option is a leak safe door in the side panel of the handicap bathtub. These tubs may be equipped with a seat inside, and often they are much deeper than a standard tub, allowing the user a more complete soak. The addition of a handicap shower or bathtub can be an excellent way for an elderly person or a person with disabilities to gain independence. Often times, if a person has a disability that would make a handicap shower or bathtub necessary, their medical insurance will cover part, if not all, of the costs involved.